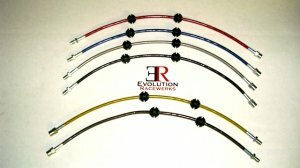 Introducing our new stainless steel braided brake lines for your BMW 1 and 3 Series. Our stainless steel braided lines feature a PTFE (Teflon) inner liner with a stainless steel outer braid. These stainless steel brake lines will improve the performance/reliability and increases the safety of your brake system by greatly reducing the expansion (swelling) of the brake line commonly seen on stock rubber brake lines. This gives you a firmer brake pedal feel and eliminates the "spongy" pedal feel during demanding conditions. Eliminating the expansion (swelling) of the brake lines will improve the consistency of your brake system. Consistency is the key to winning! 1. Stainless steel outer braid, PTFE Teflon inner liner. 2. Reduces expansion (swelling) of brake lines giving positive, firmer brake pedal feel and better control. 3. Stainless steel outer braid offer excellent corrosion and abrasion resistance. 4. Basic Kit replaces outer brake lines. 5. Standard Kit replaces ALL factory rubber brake lines. 6. Full Kit includes 2 one liter Motul RBF600 racing brake fluid. 7. Special transparent sleeve for additional abrasion resistance. Prevents stainless steel braid from "fraying". 8. Special transparent sleeve available in 6 colors: clear, black, gray, yellow, red and blue. 9. Maintains ALL factory components. 10. Includes all hardware needed to install. In the message area during check out please specify what color you would like to go with.